Maveric Abella grew up in Kapolei on the island of Oahu. She graduated from Kamehameha Schools Kapalama in 2015 and is studying Biomedical Engineering at Columbia University in New York City. She is involved with the Columbia K1 project (a Marshall Islands initiative) and the Malama Hawai‘i Club. In high school, she was on the Kamehameha Robotics Team and interned at the University of Hawai‘i Cancer Center. 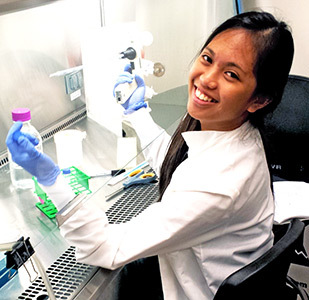 Her interest in research has spawned numerous accolades including first place at the 2015 Hawai‘i State Science Fair, first place in the American Indian Science and Engineering Society National Conference, and fourth place in Cell and Molecular Biology at the International Science and Engineering Fair. During her free time in college, she likes to go on spontaneous trips around the city, play sports, and learn to dance hula. In Hawai‘i, she looks forward to surfing, spear fishing, and meeting the other wonderful interns in the program. One day, she hopes to develop important biotechnologies and to be an astronaut. NASA investigations have revealed that spaceflight has a detrimental effect on the immune system of crewmembers on the International Space Station (ISS). However, the underlying cellular mechanisms causing deficient immune responses remain largely unknown. We hypothesize that T-Lymphocyte (T-cell) dysfunction in the microgravity environment of space contributes to a reduced immune response of ISS crewmembers in the form of oxidative stress. Oxidative stress results from high amounts of reactive oxygen species (ROS) and causes a wide variety of effects on T-cell function. Prolonged exposure to ROS has been shown to inhibit T-cell proliferation and eventually lead to apoptosis. Alternatively, low levels of ROS exposure have improved T-cell function by inducing an inflammatory response. The objective of this study is to characterize the effect of oxidative stress on T-cell phagocytosis to develop a cell model for on-orbit immune cell dysfunction investigations. Cumene hydroperoxide is utilized to induce oxidative stress in T-cells in the presence of E. coli- and S. aureus-mimicking bioparticles that undergo a fluorescent shift upon T-cell phagocytosis. The results of this study demonstrate that oxidative stress has a profound effect on T-cell phagocytosis of microbe-like bioparticles. Thus, oxidative stress may contribute to microgravity induced immune system dysfunction. This study provides the foundation for future on-orbit T-cell investigations with HNu Photonics’ on-orbit BioChip SpaceLab facility.